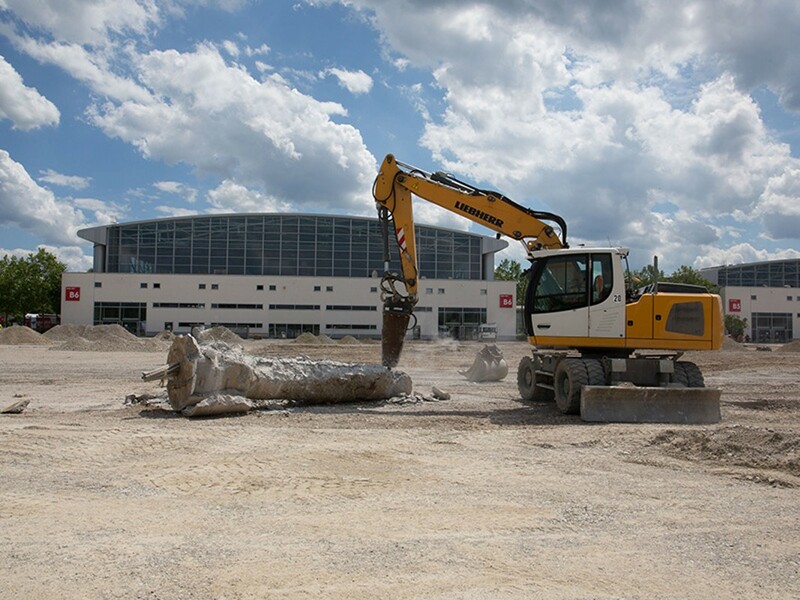 June 28, 2016 On Tuesday, Bavaria's Minister of Economic Affairs, Ilse Aigner, Munich's Lord Mayor, Dieter Reiter, and Messe München CEO, Klaus Dittrich, broke ground to complete the Messe München trade-fair center. CEO Klaus Dittrich: "This will improve our ability to serve our exhibitors and strengthen our position among international competitors." 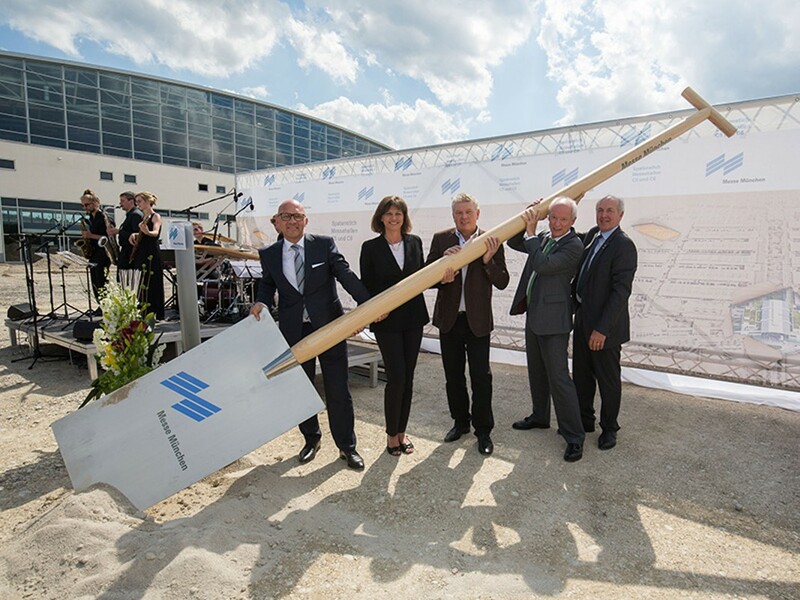 An important moment for Messe München and the entire region: On Tuesday, Bavaria's Minister of Economic Affairs, Ilse Aigner, Munich's Lord Mayor, Dieter Reiter, and Messe München CEO, Klaus Dittrich, broke ground to complete the Messe München trade-fair center. Construction of Halls C5 and C6 as well as an additional conference center mark the final phase of construction for the new trade-fair center, which opened in 1998. Following a construction period of two years, Messe München will have a total of 18 halls with 200,000 square meters of exhibition space and some 400,000 square meters of outdoor space in 2018. That will allow the company to strengthen its position on the international market for fairs and exhibitions. They broke ground on the project Tuesday afternoon while holding on to an oversized shovel together: Supervisory Board Chairs Ilse Aigner and Dieter Reiter and Messe München CEO Klaus Dittrich, assisted by representatives of the company's other two shareholders, The Chamber of Industry and Commerce and the Chamber of Trade and Crafts for Munich and Upper Bavaria. "We need these halls and the new conference center to meet our customers' growing demand," said Dittrich. "This is also a tangible sign of the success of Messe München." It is the final phase of construction of the trade fair center, which opened in 1998. Bavaria's Minister of Economic Affairs Ilse Aigner: "Construction of these new halls demonstrates that trade-fair business in Munich is on a growth path. Leading international trade fairs are a symbol of the state's technology leadership and allow the Bavarian economy to network and gain direct access to markets abroad. They also give SMEs access to business opportunities around the world." Munich's Lord Mayor Dieter Reiter: "By breaking ground for the new halls C5 and C6, we are setting another milestone in the success story of Messe München. The new halls are an important investment in the company's future sustainability, and they allow us to send a positive signal to the entire Munich region." The new trade-fair center in Riem was built in multiple phases. When it opened in 1998, twelve halls and the ICM – Internationales Congress Center München were available. Two additional halls were added in 2001. The North Entrance and two more halls were built for the Soccer World Cup in 2004. When the two new halls are completed, a total of 18 halls will be available as of 2018. They are also urgently needed because several large-scale trade fairs—bauma, BAU, IFAT and ISPO MUNICH—have been booked to capacity and have had waiting lists for years. The project will cost EUR 105.8 million. It will be financed entirely by Messe München without any subsidies from the shareholders. Klaus Dittrich: "Messe München has experienced sustainable growth since moving to the new trade-fair center. Munich is now considered one of the most successful trade-fair venues in the world." The beginning – Founded in 1964, the Munich Trade Fair Corporation grew quickly and had already reached the limits of its capacity at "Theresienhöhe" in the 1980s. 1985 – Werner Marzin, then the head of the trade-fair center, writes a memorandum about "The situation and future prospects of the Munich trade-fair center". In it, he calls for a new location for the trade-fair center using part of the area being abandoned by the airport in Munich-Riem. 1987 – The City of Munich and the State of Bavaria give their blessing to relocate the trade-fair center to Riem. It was the official go-ahead for the New Munich Trade Fair Center. 1991 – Frankfurt architect Jürgen Frauenfeld wins the European-wide urban development ideas competition that Messe München and the City of Munich launched for the trade-fair center and a new city section. 1992 – The State of Bavaria and the City of Munich reach an agreement regarding financing for the New Munich Trade Fair Center. That prompted the shareholders to make their fundamental decision in favor of the new trade-fair center. 1992 – Architekturbüro Bystrup, Bregenhoj & Partner from Denmark wins the realization competition to design the trade-fair center. 1994 – The Riem airport relocates to Erding. The groundbreaking ceremony for the new trade-fair center is on September 9. 1995 – The cornerstone is laid on June 19. 1998 – Munich's largest construction project since the Olympic Games in 1972—the New Munich Trade Fair Center—officially opens on February 12. The ICM – Internationales Congress Center München also gives Munich new significance as a congress venue in Europe. At this point in time, the trade-fair center comprises 12 halls with 140,000 square meters of exhibition space. Cost of construction: EUR 1.2 billion. 2001 – The trade-fair center is expanded with the addition of Halls C1 and C2. 2004 – The trade-fair center is expanded with additions on the north side of the grounds. Halls C3 and C4 and the North Entrance open on December 13. The trade-fair center now has 16 halls with 180,000 square meters of hall space. Total cost up to this point: EUR 1.473 billion. 2014 – The shareholders of Messe München approve plans to complete the trade-fair center by building two new halls and a small conference center. The final phase of construction is estimated to cost EUR 105.8 million and will be financed by the company entirely on its own without funding from the shareholders. Construction will last two years. When completed, the trade-fair center will have a total of 18 halls with 200,000 square meters of space and an outdoor exhibition area with some 400,000 square meters.